In addition to ballet, Fiona is out to prove she has other talents. Such as . . . match-making. She sets out to start a club with her friends and classmates to pair teachers and friends together-- but in the end, learns that she is much better at match-BREAKING. Fiona Finkelstein had a bad feeling. It was the kind of feeling she got when she just knew that Mrs. Miltenberger packed a corned beef sandwich in her lunchbox, even though she’s told her a gazillion times that she HATES corned beef more than she HATES anything else. Especially after learning that there was actually no corn in it. If there was one thing Fiona flat-out could not stand, it was food that lies. Fiona didn’t know exactly why she was having this feeling today. Maybe because today was the day Mr. Bland, her fourth-grade teacher, was going to draw names for new classroom jobs. For months, Fiona wanted to be picked for electrician. But no matter how tightly she crossed her fingers, Mr. Bland always pulled somebody else’s name out of the bucket. “What will that do?” asked Cleo. “Gardener?” said Fiona and Cleo at the same time. “Oh, Boise Idaho. What?” said Harold. “And turn off the lights,” said Cleo, who was electrician the time before last. “So?” said Harold, wiping his finger under his desk. Fiona sighed. Besides being a nose-picker, Harold was the only kid she knew who said things like “Oh, Boise Idaho” and who didn’t like cool things like plugs. Sometimes Fiona thought about the possibility that Harold was really an old lady disguised in a boy suit. The new boy, Milo, stuffed his hands into his pockets and looked down at his feet. Fiona was trying to remember where Minnesota was because there were lots of M-states and she got them all mixed up. It occurred to her then that Milo also starts with M and wasn’t that funny. Fiona wondered why there weren’t any states that started with F and wasn’t that unfair. And then she thought of one. “Florida!” she shouted in excitement. Everyone looked at her. And then they cracked up. Except for Mr. Bland and Principal Sterling. And Minnesota Milo. “I was just thinking how Florida begins with F like Fiona,” she explained, “the same way that Minnesota begins with an M like, you know, Milo?” Fiona’s voice got softer as she got to the end of her explanation and realized how dumb she sounded. Why was it that the thoughts in her head seemed really smart until she said them out loud? Everybody laughed again. Except for Mr. Bland and Principal Sterling. And Milo. They just stared at her. As Milo reached his desk, he looked at Fiona and scowled. Fiona didn’t know what she had done to deserve such a look from somebody she hadn’t even talked to yet. But since she was not the kind of girl to let a scowl go unanswered, she shot back with an over-the-shoulder Doom Scowl, with medium doom. Milo looked at Fiona. He shook his head and then turned around to Harold Chutney at the desk behind him. They grow them rotten in Minnesota, Fiona thought. Milo moved his chair slowly toward Fiona. She moved her math book exactly one-half inch in Milo’s direction. That was as far as she was going to go. All during math, Milo turned the pages of Fiona’s book before she was ready. And each time she turned them back, he mumbled something under his breath. Something that Fiona couldn’t quite make out. Which made her grit her teeth. The second math was over, Fiona pulled her book away, slammed it shut, and shoved it into her desk. Then she raised her hand. She couldn’t wait any longer. “When are you going to draw names for classroom jobs?” she asked when Mr. Bland called on her. Mr. Bland sighed. “Fiona, whatever would I do without you?” Only he didn’t say it in a cursive-letters-on-a-greeting-card kind of way. He said it in a way that made her think Mr. Bland knew exactly what he would do without her. “Oh,” said Fiona. She wasn’t counting on that. Milo went over to the Job Center. Fiona chewed on her Thinking Pencil as she watched Milo read the duties listed under each job. He took a gazillion years. Finally, he wrote his name on a slip of paper and dropped it into the bucket marked ELECTRICIAN. “And now for the big moment,” said Mr. Bland, reaching into the first bucket marked COURIER. Fiona was busy crossing each of her fingers while Mr. Bland read off the names in each bucket. Only one bucket mattered to her. “And lastly, classroom electrician,” said Mr. Bland. “Wait!” Fiona said, as her pinkie slipped off her ring finger. She quickly recrossed them. “Okay, now I’m ready.” She watched Mr. Bland pull out a piece of paper and unfold it. As she watched, the corned beef feeling got so strong she could almost smell it. 2. 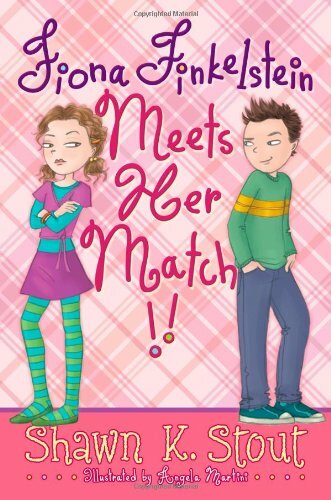 Fiona Finkelstein Meets Her Match! !